When I was invited by Pure PR (http://purepr.com/) to go to Tracie Giles salon in Knightsbridge to find out more about CACI, I jumped at the chance. I’ve been hearing a lot of buzz words like ‘Non – invasive’ for a while now, and I wanted to go and find out what it’s all about. Let’s face it, we would all like to look a bit younger, and doing it without a needle prodded in your face is an added bonus (I am actually petrified of needles since having my toe sewn back on during a season in Greece). Tracie’s Salons is GORGEOUS (http://www.traciegiles.co.uk/). First impressions were very good indeed. The whole salon is really chic and girly, and I would happily spend some hours there getting glammed up for a night out. When we go into the salon we were greeted with a prosecco and told the plan for having a little CACI talk. I’m all up for learning and I’m actually a massive science geek, so this was all good to me. We were taken down to the lush downstairs treatment room, and given some facts about CACI. I was pleasantly surprised to find out that Courtney Cox, Jennifer Aniston and J-Lo are all fans (J-lo has her own machine, which she takes around the world with her). Let’s face it, this is a clear reference on how good it is, because I’ve never heard anyone say ‘Oh Jennifer Aniston? No she looks TOO young and beautiful for her age, god I wouldn’t want to look like her’. 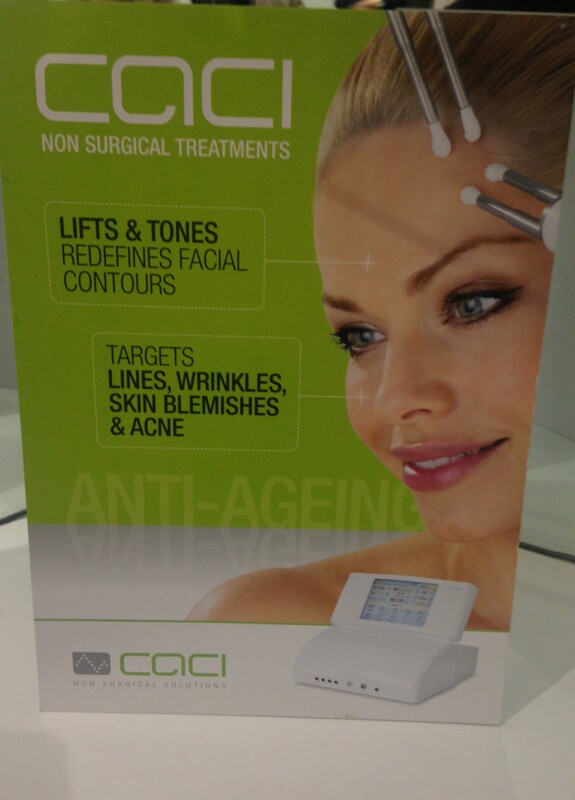 So you might be looking at this CACI machine thinking it looks a bit intimidating, but trust me its not. All the completely non-surgical procedure does, is deliver a small micro-current, that among many things encourages the body to produce more collagen and elastin naturally. It also increases the circulation, giving an all round tighter look and feel. We were invited to have a closer look and actually have a feel on our hands (NB – this picture does not portray a lightsaber). So in case you were wondering, no this little treat doesn’t actually hurt at all. In actual fact, when I tried it on my hand I didn’t feel a thing. This is why I jumped at the chance to have a free mini treatment, and have a little brow lift. As well as suffering from quite bad ‘laughter lines’ (because I’m such a funner, obviously) my eyes were quite tired from being quite ill for the last week. The great thing about CACI is they can chop and change the settings on the machine to give you a completely tailored treatment. During the actual treatment, I could again not feel a thing. After one eye, I jumped up to have a look in the mirror, and was very pleasantly surprised. As you can see, my right side is a lot tighter and more defined (and the treatment somehow even managed to make my eyebrow look neater). you can still quite clearly see the lines under my eyes on the left, but VOILA they have disappeared on the right hand side. My long suffering best friend Little Em came along with me, and I’m glad I took her because she actually does lashes and she’s a great person to have around for beauty blogging. she had her lips done, again in a small mini treatment, and they looked fab! So after months and years of hearing all about these non-surgical treatments, I finally got to try it, and I wasn’t disappointed. The treatments are cumulative so if you want to keep your results, you need to keep up the treatments. You could do worse than to have to sit in Tracie’s gorgeous salon for an hour though. In fact, I would suggest checking out her salon anyway, for all of her bespoke treatments. If you want to learn more about CACI, you can visit their website for a bit of a more detailed explanation, I think I should leave it to the scientists as all I was interested in was how good my face looked. We were also treated to some fantastic goodie bags by Tracie and CACI, with the Amino – lift Peptide Complex in it. I’ve been using this for a couple of days now, and it’s making my skin feel amazing. I’m almost positive I am going to start being mistaken for J-Lo any day now.